Like a lot of companies, one of my clients closes down over Christmas and re-opens their offices in the New Year. They don’t want their Adwords campaigns running during this time as there is no-one in the office to handle any enquiries, so getting the leads in would be mostly wasted money. 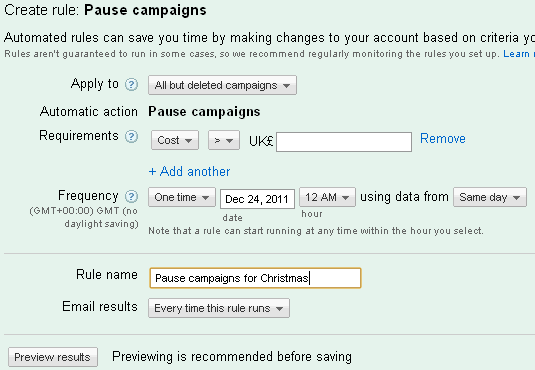 Adwords has a tool to help schedule when you want campaigns paused, called ‘Automate’, but I didn’t find the help for it particularly useful for pausing over the Christmas period. Once I’d got it sorted out, I thought a write up would be useful, for me next year if for no-one else. 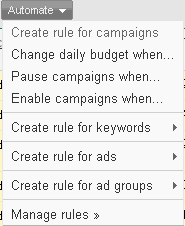 First, login to Adwords and go to the ‘Campaigns’ section. Click the ‘Automate’ menu on the bar just above the campaigns. 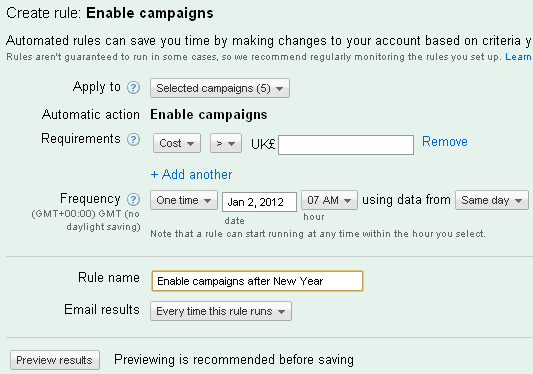 On the ‘Create Rule: Pause campaigns’ panel that opens up, change the ‘Frequency’ to ‘One time’, and the date and time next to it when you want the campaigns to pause. In my case that’s 12AM (midnight) on 24th December – Christmas Eve. Set ‘using data from’ to ‘Same day’, it’s not actually needed for this rule. Name the rule something useful, and choose to receive an e-mail whenever the rule runs – this is so you can make sure it runs properly on the day it’s supposed to. If you preview the results, it told me the five campaigns would pause if the rule ran now. The rule is going to trigger on 24th December at 12AM so that’s fine. You can now hit ‘Save’. Set the frequency to ‘One time’, the date to the date you’re going to get back to work (in this case, the client wants to set the campaign to start the day before they return to the office in the new year as they know their customers will start to search for their services to get a jump on their work) and set ‘using data from’ to ‘Same day’. If you click ‘Preview results’ it will say none of your campaigns will be affected if you run the rule now. That’s fine, as in the future when this rule runs all the campaigns will be paused and you’ll want them to come back to life the way they are now. There’s lots more to be done with the ‘Automate’ facility, but that’s all you need to use to pause your campaigns over Christmas. Good luck with it! This entry was posted in Adwords and tagged Christmas, holiday on December 21, 2011 by Paul Silver.